This special issue on the psychology of knowing about knowing bridges the parallels between social and cognitive psychology. It further illustrates the benefits of pursuing in depth these connections and the phenomena and implications associated with them. Volume 2, Number 2, 1998. Contents: INTRODUCION: W. Mischel, Metacognition at the Hyphen of Social-Cognitive Psychology: Introduction. ARTICLES: N. Schwarz, Accessible Content and Accessibility Experiences: The Interplay of Declarative and Experiential Information in Judgement. J. Metcalfe, Cognitive Optimism: Self-Deception or Memory-Based Heuristics? 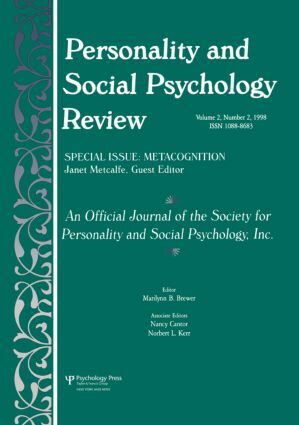 F. Strack, J. Förster, Self-Reflection and Recognition: The Role Of Metacognitive Knowledge in the Attribution of Recollective Experience. P.M. Gollwitzer, B. Schaal, Metacognition in Action: The Importance of Implementation Intentions. J.T. Jost, A.W. Kruglanski, T.O. Nelson, Social Metacognition: An Expansionist Review.